With far-right forces on the rise across Europe, Ada Colau’s progressive administration in Barcelona shows how local government can be a base of resistance. The sudden change in Spain’s government at the start of June, with socialist Pedro Sánchez replacing conservative Mariano Rajoy as prime minister, has drawn fresh attention to the country. Since the emergence of the 15M (Indignados) protests in 2011, which inspired similar “square movements” such as Occupy Wall Street, Spain has become a laboratory of post-crisis politics. Hit hard by the financial crash, from 2011 to 2014 it saw an impressive series of anti-austerity mobilizations, which paved the way for the creation of the left-wing populist party Podemos. At the same time, a series of innovative local coalitions have emerged to challenge the traditional parties, reaching power in such major cities as Madrid, Cádiz, Valencia, Zaragoza, and Barcelona. Barcelona en Comú (Barcelona in Common), an electoral force built by social-movement organizers and led by globally renowned housing activist Ada Colau, has now been governing Barcelona for three years. Colau’s administration has doubtless faced a particularly difficult political conjuncture, dominated by the conflict over Catalonia’s independence. Yet Barcelona en Comú has stacked up an impressive record in policy areas such as housing, gender equality, social policy, refugee rights, and environmental questions. In a Europe dominated by a renewed neoliberal offensive and the rise of far-right forces, it is no exaggeration to call Barcelona an island of hope for radical and progressive politics. Barcelona’s insurgent mood is rooted in a centuries-long history. In the nineteenth century, a city becoming Spain’s most important industrial center saw the rise of strong socialist and anarchist movements. Barcelona also has deep-seated republican values and was a bastion of resistance to Francisco Franco during the 1936-1939 Spanish Civil War. But the transition from his four-decade dictatorship to democracy in the late 1970s greatly sharpened the city’s political identity. The asociaciones de vecinos — grassroots movements popping up in countless neighborhoods to help drive the transition process — spread across Spain. But this produced a particularly strong legacy in Barcelona. The first municipal elections in 1979 saw the beginning of an enduring engagement between urban movements and city governance. The ruling Socialist Party answered demands from below by expanding welfare provision and building structures that would allow more democratic forms of policy-making. However, this same party would soon preside over a reversal of such moves, as Barcelona gradually abandoned its industrial economy and became a global city. The 1992 Olympic Games sealed this transition. If widely regarded as a successful example of urban revitalization, this event also marked the increased dominance of corporate interests, to the detriment of popular ones. The movements’ ties with municipal power eventually vanished in 2011; after thirty-two years, the uninterrupted Socialist hegemony came to an end, and conservatives took over city hall. By the early 2010s, Spain was beset by the storm of economic crisis and austerity. The 15M movement erupted in 2011, demanding a deepening of democracy and social justice while pointing an accusing finger at political and economic elites. In this context, a Plataforma de Afectados por la Hipoteca (Platform for People Affected by Mortgages, or PAH) movement emerged in Barcelona, before then spreading across all of Spain. It was among 15M’s most significant organizations because of its large constituency and the significant victories it achieved. At that time, however, one could hardly have guessed that its spokesperson Ada Colau would soon become the mayor of a European capital city. This development can be understood only in light of the anti-austerity movements’ impressive breakthroughs at the level of public opinion (polls show that at the height of the mobilization around 80 percent of Spaniards agreed with protestors) and, on the other hand, the deep distrust of the established party system, dominated by the conservative Popular Party, the Socialists, and the regional-nationalist parties in Catalonia, the Basque Country and elsewhere. These anti-establishment sentiments soon gave rise to new parties. On the Left, this space was occupied by Podemos. Many progressive coalitions were also built at the local level, including Barcelona en Comú (Barcelona in Common). This platform was born in 2014 upon the initiative of a small group of activists and intellectuals led by Colau. It rapidly drew sections of Barcelona’s social movements and progressive parties (including Podemos) into a coalition galvanized by a straightforward objective: winning the 2015 municipal elections. After occupying the squares, it was time to occupy the institutions. Barcelona en Comú crafted its policy agenda through a sustained process of political participation. Radical demands were drawn together in multiple areas, such as housing, social policy, environmental justice, immigration, gender equality, and democracy. 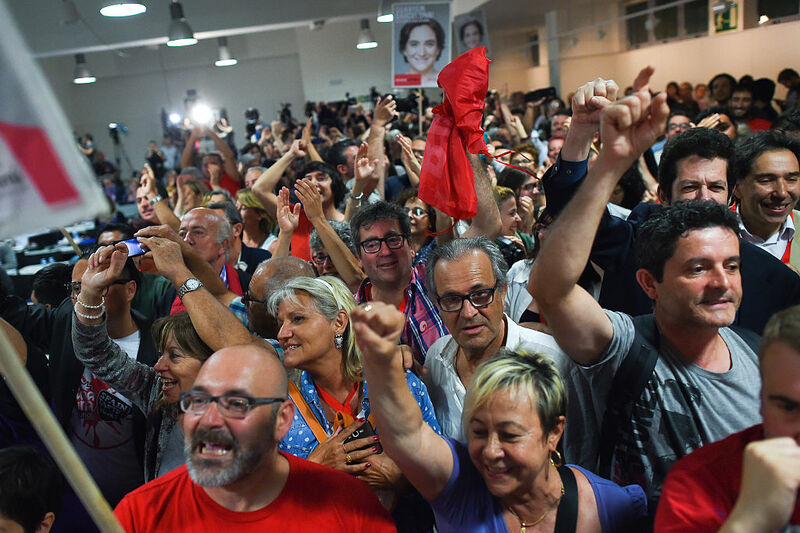 When municipal elections were held in May 2015, Barcelona en Comú obtained the biggest share of votes (25 percent) and the greatest number of seats in the council (eleven out of forty-one) and now rules in a minority government. After years at the margins, social movements stepped into Barcelona’s city government. The institutional adventure has not been easy. Less than one year before the next local election, it is important to understand both the successes and limitations of Barcelona’s radical municipalism, in particular by questioning how much of its platform has really been fulfilled, and assessing its role in the wider Spanish and Catalan context. The 2008 Great Regression hit Spain mostly through the bursting of a real-estate bubble, with devastating consequences for many families. More than 170,000 evictions took place in Spain only between 2008 and 2012, according to the PAH. Housing is still the biggest focus of discontent in Barcelona and the battleground where oligarchic privileges are hardest to beat. The city administration has adopted a multifaceted strategy to assert the principle that housing is a right. A “Unit Against Residential Exclusion” has been set up to mediate between owners and families at risk of eviction, thus placing the latter in a stronger negotiating position. This has prevented roughly two thousand evictions in two years. Banks have repeatedly been fined for leaving their properties empty. A side effect of such vast amounts of houses being left vacant is that drug dealers and addicts have occupied the abandoned dwelling. At present these “narcopisos” are of the thorniest topics on the administration’s agenda, with mainstream media fueling popular concerns. Housing is a strong suit for the former activist Colau, and she has also tackled this question through unprecedented investment in the direct provision of accessible homes. Barcelona’s stock of public housing has traditionally been meageR — below 2 percent of the total. The city government has quadrupled the budget devoted to this. It is both purchasing existing real estate, as in the case of highly symbolic sites like the Teatro Arnau, and building new sites, even resorting to prefabs in order to cope with emergencies. The housing crisis is also related to the massive influx of tourists to Barcelona. A new plan was approved in order to tame this trend, and already more than two thousand illegal accommodations have been shut down — including AirBnB properties without tourism licenses. Additional measures include financial subsidies for the most vulnerable households and housing cooperatives. These endeavors notwithstanding, Barcelona is still under severe strain. More than 2,500 evictions took place in 2017 and, as an indirect consequence of the mortgage crisis, rental prices are soaring (up 29 percent since 2014). The complicity of political elites has fed rampant speculation and the concentration of property ownership, especially thanks to the Popular Party’s policies in central government. Barcelona is also a pioneer in social policy more broadly. The city invested €201 per inhabitant in 2017, the highest increase among all Spanish municipalities (a 20 percent rise compared to the previous year). The privatization of social services has been at least partly reversed, as the city aims not only to take care of citizens through their lifecycle, for instance through kindergartens, but also when they pass away. After decades of privatization, the city government is now funding its own funeral parlor, aimed at ensuring decent and accessible funerals also for more deprived families. The commitment to social policy is also pursued by means of new human resources (the municipal government has hired an extra two thousand employees) and imposing fairer criteria in public procurement (for example in terms of gender equality, labor rights, and environmental justice). Much of Barcelona En Comú‘s electoral agenda was focused on re-municipalization as a means of tackling “energy poverty,” where families cannot even afford a basic supply. The city government is proceeding at a relatively slow pace in this regard, also due to the strong private interests it is challenging. While the municipalization of the water supply is still taking its first steps, more concrete results have been achieved with respect to electricity. The Barcelona Energia company provides 100 percent green energy to the municipality itself and — in the near future — also to twenty thousand families. Its governance model is aimed at empowering citizens by making electricity a ‘common’ to be self-managed rather than a mere property of the state. For Colau’s cabinet, this kind of “energy sovereignty” is the best antidote to privatization, as people will be keener to defend the resources they share when they enjoy true ownership over them. Feminism is central to Barcelona en Comú’s outlook, in a manner rarely before seen in Spanish politics. One of the local government’s priorities is the struggle against gender-based violence, which has become a central issue since the mass feminist strike and protests of March 8, International Women’s Day. The city council has increased the budget for housing for victims of violence and specific employment plans, and has launched the campaign “Barcelona Antimasclista” (Anti-Sexist Barcelona), which has engaged nightlife venues in the struggle against sexual aggression. In addition, the city council has created a unit to assist victims of human trafficking. Here, it is pushing the boundaries of its powers, since in principle this issue is a responsibility of the central government. Ada Colau’s administration has also elaborated a Plan for Gender Justice that seeks to integrate gender criteria in all local policies, including urban design. Any change in the city’s design must now take into account the likely effect for women (by way of example, this demands wider sidewalks for caretakers with children, and more street lighting to discourage attacks). Barcelona is also a leader in the field of environmental sustainability. An anticontamination protocol was approved to reduce CO2 emissions by limiting the use of cars, at the same time as investing in green urban mobility. Pilot projects for traffic-free “islands” have been launched, an extra forty-four hectares of green spaces have been created, bike paths have been extended by 40 percent in two years, a new Marina metro station was opened, and the public transport stock was extended and renovated. In addition, a new streetcar is planned to connect the inner city and the metropolitan area. This flagship initiative has already been planned at the technical level, but was obstructed by the opposition of Esquerra Republicana de Catalunya (ERC, a pro-independence center-left party) in the city council. Ironically, the project was part of this latter party’s own electoral agenda, leaving no doubt about the instrumental nature of its opposition. International media have put Colau in the spotlight on account of Barcelona’s commitment to human rights for migrants and refugees. The city administration has a long-standing record of progressive policies on migration-related issues (Barcelona enacted its first programs to support migrants in the 1980s, when foreign immigration was close to zero). The new administration is mostly seeking to deepen such trajectory, with some exceptions. It is critical of the EU and even more so Spain’s own central government for their approach toward border patrols and receiving refugees. Barcelona has not been a key site for migration routes as in the cases of Italy and Greece. This is also why Colau has repeatedly called on Spanish government to abandon its disinterested attitude toward the humanitarian crisis and to comply with its international obligations by providing secure avenues towards the country. The poor implementation and scope of Spanish asylum policy is leaving many migrants without protection — a legislative void that the municipality is seeking to fill with its Barcelona Refuge City plan, aimed at creating a stable means of reception that operates regardless of the central state. Pivotal to this strategy is the building of a transnational network of solidarity between cities and civil society organizations. Almost 4,405 refugees were assisted by municipal services in 2017 (as compared to 304 in 2012). The city government also sought to aid undocumented immigrants by trying to shut down the expulsion center in the city and prevent deportations by issuing ID cards at the local level. Initiatives on diversity and multiculturalism become especially important. One key example was the “I’m Not Afraid” demonstration, organized in response to the ISIS terrorist attack in the city last August. This march also sought to avert the spread of xenophobic, anti-Muslim discourse. Moreover, the local government has created an “anti-rumors network” together with hundreds of associations and individuals, aimed at countering stereotypes and canards that target minorities. Controversies over migration are more visible when it comes to street vendors — migrants of usually Sub-Saharan origin — a collective that has become very vocal in the city. While Colau’s administration is attempting to regularize some of these migrants and to soften repression against them, parts of the city’s police continue their raids targeting such groups in public spaces. This issue has often put Colau’s cabinet on the defensive, sparking criticism from various fronts. Some social movement organizations, such as the street vendors’ union, have repeatedly attacked Colau’s cabinet for not doing enough to materially aid these migrants and merely exploiting their grievances for the sake of consolidating political support. Similar criticisms are sometimes also leveled by activists working on the issue of refugees. Citizen participation in local governance has been another axis of Ada Colau’s government, which has benefited from Barcelona’s long tradition of participatory governance. Barcelona en Comú has innovated in this field with a new Regulation of Citizens’ Participation and the creation of Decidim Barcelona (“We Decide Barcelona”), a website that allows residents to get directly involved in the elaboration of public policy. The site was launched in 2016, with a call for proposals from individual citizens and associations that could then inform a Local Action Program—the document that guides the local government’s action across its term. Around thirty thousand people participated in the debates even in the first three months, and the number has increased since. The online discussions are combined with physical meetings, in order to guarantee “an inclusionary model of participation,” as the website of the City Council states. This example of activists forming a municipal government is so exceptional that poses more general questions of participatory democracy. No neat distinction can be drawn between routine politics and the politics of protest; indeed, it can even be damaging to imagine such a division. Office-holders in the institutions are not inevitably counterposed< to movements, but can act as a megaphone for protestors by making their claims more visible and legitimate. Of course, this also carries risks. The case of street vendors is powerful in showing two main shortcomings. First, the radicalism of Colau’s government has sometimes been perceived as an appropriation of the energy of the activists who are not in city hall. Second, when Barcelona en Comú comes up against the limits of institutional politics, this can also risk turning popular aspirations into mere frustration. As we shall see, beyond matters for which the administration is itself responsible, many such constraints are external and hard to be remove through the levers of local politics. Ada Colau and Barcelona en Comú’s administration has been confronted with the inherent limits of local government (a lack of funding and a lack of power in many areas) but also a particularly complex political conjuncture. Most of Colau’s term has coincided with the height of the Catalan pro-independence movement, a period of growing polarization within Catalan society, in which Mariano Rajoy’s conservative government harshly repressed pro-independence mobilizations. Barcelona en Comú has, moreover, faced this difficult situation as a minority government supported by only eleven of the city council’s forty-one members, forcing Colau to reach agreements with different parties if she is to pass any policy. Local administrations suffered severe financial strain as Rajoy’s government imposed strict limits on their spending. Socialist Pedro Sánchez’s recent appointment as prime minister, with the support of Podemos and the Basque and Catalan nationalists, will probably soften these restrictions. The nomination of a European bureaucrat as the Economy Minister shows that the new government does not intend to deviate from the orthodoxy of austerity. But even a slight softening of the financial pressure on municipalities will be welcomed by Colau’s government, much like the other local administrations headed by Podemos and its allies in Madrid, Valencia, Zaragoza, Palma, Cádiz and other cities. However, the biggest obstacle for Barcelona en Comú has been a political one. The conflict between the massive Catalan independence movement and Rajoy’s centralizing government reached its height in autumn 2017 when Carles Puigdemont’s regional government held a referendum on self-determination, after years of campaigning by pro-independence movements and the anticapitalist CUP party. As the Constitutional Court had already banned the referendum, Spanish police unleashed heavy repression in the attempt to stop it taking place. But while hundreds were injured, the unofficial vote went ahead, and Puigdemont declared independence with the backing of some two million Catalans. In turn, the Spanish judiciary jailed several Catalan politicians and social leaders, under vague charges like violent rebellion. Rajoy reacted by suspending Catalonia’s autonomy, in a decision widely deemed unconstitutional by jurists. This is the context Ada Colau has been caught up in. Barcelona en Comú and Podemos have repeatedly been accused of ambiguity on the issue of Catalan independence, by both supporters and detractors of secession. Colau voted “yes” to independence in a non-binding consultation held in 2014, precisely as a way of demanding a binding referendum. This proposal is supported both by the large majority of Catalans, and Podemos and its allies, including its Catalan sister party Catalunya en Comú. However, the Barcelona mayor also had to take a position on the events of autumn 2017. Colau considered the October 1 referendum as a “mobilization” rather than a binding vote, but reached an agreement with Puigdemont to open the city’s schools as polling stations, as well as repeatedly condemning police repression and the prosecution of pro-independence leaders. She has termed the jailed politicians “political prisoners” and has demanded their release. However, the Barcelona mayor has also criticized the pro-independence parties, accusing them of lying to Catalan society about the real possibilities of an immediate break from Spain. Barcelona en Comú’s intermediate position amidst sharp political polarization seem to have wounded its electoral prospects. Catalunya en Comú obtained less than 8 percent of the vote in the December 2017 regional elections. Most of the electorate voted in relation to their position on independence, which benefited the right-wing pro-independence Junts per Catalunya (the coalition led by Puigdemont, overthrown by the Spanish government after he briefly declared independence) and the Spanish nationalist Ciudadanos. If these electoral dynamics continue in the 2019 local elections, Ada Colau’s government will be endangered. The latest polls show a likely victory for Barcelona en Comú, but if there was a pro-independence coalition it would probably win. Colau’s strategy is clear: insisting on the impressive record of her government in social policies, shifting the conversation from the national conflict to the living conditions of the people of Barcelona. Barcelona en Comú’s original mission was to bring the voice of the many to the heart of power. Three years in office confirmed this trajectory — and radically changed the city. Barcelona is still a beautiful, cosmopolitan centre in which culture, science, and technological innovation can flourish. At the same time, municipal politics is transforming citizens’ everyday lives for the better—especially those hardest-hit by austerity and oligarchs’ greed. Such efforts travel beyond the borders of the city. Building an international network of “fearless cities” is key to Colau’s strategy. The aim is to place Barcelona on the frontline in spreading radical practices and discourse across the globe. While most of Europe seems trapped in a race to the bottom fueled by neoliberalism and far-right populism, Ada Colau’s Barcelona is a pioneer in delivering social justice and democracy. Yet there are clear shortcomings. The local government has suffered the negative consequences of being a minority in the council and the polarization of Catalan politics over independence. If the obsession over the territorial conflict invades local politics, Ada Colau’s government will be in danger. But if the May 2019 electoral campaign is focused on the problems of Barcelona’s citizens, the path of progress opened by Barcelona en Comú can likely continue, inspiring radicals across Europe. Raffaele Bazurli is a PhD candidate in political science and sociology at the Scuola Normale Superiore, Florence. Pablo Castaño Tierno is a graduate student of political science at the Autonomous University of Barcelona and has written for Contexto , Regards , Novara Media , and the Independent .